Why have huge trees that overwhelm your yard? Do you really want to climb ladders to pick your fruit? All this can be avoided. Your home garden is different from a commercial orchard. Most people want small fruit trees that produce enough delicious fruit for the family and a few friends - not commercial sized trees optimized for high volume and tractors. Standard fruit trees naturally grow to 20-30 feet. Even if you use semi-dwarfing rootstocks, most fruit trees still grow 15-20 feet - larger than people expect. 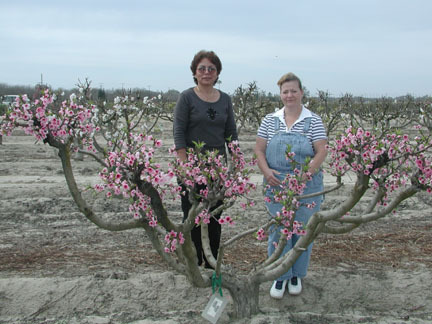 Through deliberate pruning, you can control the size and shape of your fruit trees regardless of rootstock. Why not keep it 6 to 12 feet tall with most of the fruit in the easy-to-reach 4 to 7 foot range? 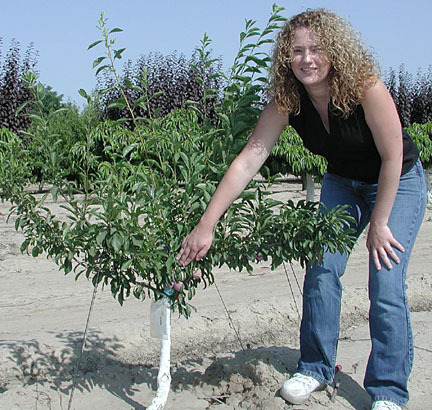 EZ-PICK® fruit trees have been started in the nursery with a very low branching structure giving you a jump start at maintaining a tree to a size that is convenient for you. There is another benefit to smaller trees - they give you room for multiple varieties of your favorite tasting fruits. This 7 year old Burgundy Plum tree has been kept pruned so the main fruiting branches are within easy reach. After fruiting, these plums can be summer pruned back to your preferred height. Spring blossoms on a 7 year old nectarine trained with open center. Why use ladders when you can reach all your fruit comfortably while standing safely on the ground. 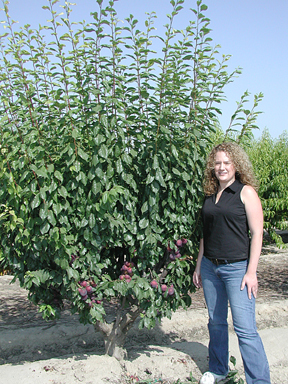 1 year old EZ-PICK® plum tree in orchard.